Memphis' local radio station is getting a new sponsor, and its own beer, for its signature party overlooking the Mississippi River. It's us. 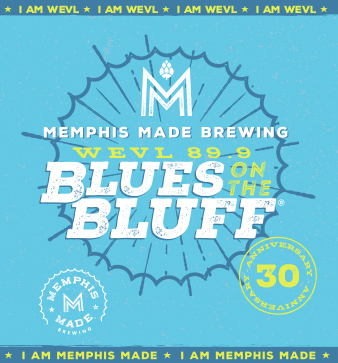 WEVL 89.9 FM has named Memphis Made Brewing as its beer sponsor for the 30th Annual Blues on the Bluff. We're bringing the beer for this signature event, held this year on July 21, 6-11 p.m. at the Metal Museum. There will be cans of Fireside and a limited edition new beer at the party. We brewed a batch of Junt, our popular cream ale, with lime juice to give it a twist of summer just for our friends at WEVL. It's a good beer to drink while listening to great music with a view of the Mississippi River. Blues on the Bluff will feature music from Kenny Brown Band, Marcella & Her Lovers, and Lightin' Malcolm. Admission is $20 in advance, $25 at the gate. Proceeds from the beer sales will go to WEVL. Central BBQ will be on hand as well. There will also be a silent auction. After Blues on the Bluff, the beer will be available on draft and six-packs to-go at Memphis Made’s tap room.